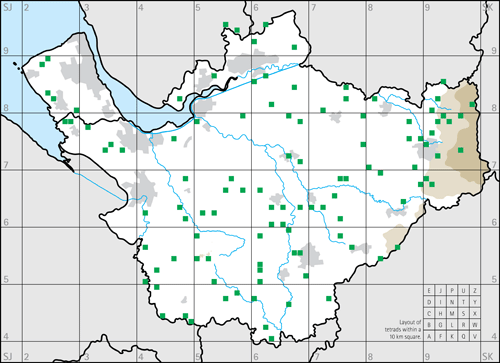 The following analyses were based on survey work carried out on 109 selected 1-km squares in Cheshire and Wirral. Of these, 69 1-km squares were surveyed through the BTO / JNCC / RSPB Breeding Bird Survey (BBS) in 2004 and / or 2005. An additional 40 1-km pastoral squares were surveyed in 2005, as part of a project to provide a baseline against which change could be monitored following the introduction of the Entry Level Stewardship Scheme (ELS), which encourages farmers to deliver environmental management measures. Full details of the BTO / JNCC / RSPB, Breeding Bird Survey (BBS) (and fieldwork carried out for Entry Level Stewardship survey work which uses the same methodology) are provided by Raven et al. (2007). In brief, fieldwork involves two visits to each square, the first between early April and mid-May and the second between mid-May and late June. Birds are recorded in each 200 m section along two 1 km transects. The perpendicular distances of birds from the transect line are recorded in three distance bands (0-25 m, 25-100 m, 100 m or more). The number of distance bands here is a compromise between collecting useful data and ease with which volunteers can carry out the survey. Ideally the actual distances to birds would be recorded. However, as long as birds are recorded in the correct band, population estimates based on a small number of bands will be unbiased, with uncertainty reflected in the associated estimates of variance (Buckland et al. 2001). Counts begin at 0600-0700 hours where possible, to coincide with maximum bird activity, whilst avoiding concentrated song activity at dawn. Flying birds that are actively using resources in a square, such as displaying Skylarks, hovering Kestrels, hirundines and Swifts are assigned to the appropriate distance band; other records of flying birds are not used in our analyses. Whilst BBS squares were selected according to a random sampling design (see map), ELS squares were selected at random from pastoral squares as classified using CEH LandCover data (Haines-Young et al. 2002). Unless this sampling design is taken into account, there is the potential to overestimate the population size for species associated with pastoral habitat and underestimate population size for species not occurring in this habitat. For this reason we consider the data as being of two strata, pastoral squares (ELS squares + BBS pastoral squares) and non-pastoral squares. The method for producing population estimates and 95% confidence levels from these data is discussed in brief below. This analysis was conducted in collaboration with Dr S.E. Newson at the BTO and full details will be published elsewhere. Observers are asked to exclude juvenile birds from counts where possible because the inclusion of such individuals would inflate estimates of the breeding population. Exploratory analyses of BBS data have shown that such errors are more likely for species that breed early, mainly residents, and that were counted during the late visit. Conversely, most long distance migrant species are still arriving in the UK during the first visit period, thus counts of these species during this visit may lead to their densities being underestimated. To control for these biases we only use data from early visits for resident species and only from late visits for migrants. Habitat within each 200 m transect section was recorded by volunteers according to a four-level hierarchical coding system that documents the main habitat type in one of nine categories, e.g. farmland, woodland or semi-natural grass / heath and bog, together with a number of finer level habitat features such as the type of farmland, the nature of field boundaries and the crop (Crick 1992). Detectability must be taken into account when converting count data into densities, and subsequently population estimates, otherwise these variables will be underestimated. This was achieved using distance sampling software (DISTANCE, version 5.0 Release 2; Buckland et al. 2001; Thomas et al. 2006) to model the decline in detectability with distance from the transect line. Birds recorded in the final distance band (100m or more) were excluded from the analyses, because counts within an unbounded category are difficult to interpret. Whether birds are in flocks is not recorded in the BBS, and the majority of species tend not to form flocks during the breeding season, so we assume that counts are a collection of individual birds rather than modelling the detectability of flocks. Even for species that sometimes form groups during the breeding seasons, such as barn swallows Hirundo rustica, this approach is likely to yield a reliable population density estimate if four conditions are met: (i) all flocks on the transect line are detected, (ii) mean flock size is not very large, (iii) flock size is not highly variable, and (iv) detectability of flocks is not very low (Buckland et al. 2001). For the majority of species in this study these conditions appear likely to be met. Habitat types differ in the structure of their vegetation and are thus likely to influence detectability to varying extents. Detectability may also vary between regions for a variety of reasons, including that (i) the structure of a single main habitat type, e.g. broadleaved woodland, may differ with geographical location (e.g. denser woodlands in southern UK) and (ii) population densities may differ between regions and in those with high densities individual birds may need to invest more time in territory defence and thus sing more frequently, increasing their detectability. We took into account heterogeneity in detectability arising from variation between habitats and regions (stratum) by including these as factor covariates in a global multiple-covariate detection function, and estimating density by applying this detection function to the observations within each stratum. This approach uses the whole dataset to provide information about the shape of the detection function, so it was not necessary to fit a separate detection function to each habitat combination, while the stratum level data are only used to fit the shape (see Marques & Buckland 2003 for details). Following Buckland et al. (2004) we fitted half-normal and hazard-rate distributions, known as key functions, to the data; - other key functions available in DISTANCE either do not allow the inclusion of covariates (uniform key) or have an implausible shape (exponential key). We identified nine main habitat types (broad-leaved woodland, coniferous woodland, mixed woodland, semi-natural grassland / heath and bog, arable, pastoral and mixed farmland, human habitats and water bodies) based on Crick (1992) and adopted the following stepwise approach. For each species we estimated f(0), i.e. the value of the probability density function of perpendicular distances at zero distance, without including habitat covariates to both half-normal and hazard rate models. We then added habitat as a covariate and established whether the model fit was improved, defined as a reduction in the Akaike’s Information Criterion (AIC), and identified the best fitting model. We then fitted a model with both habitat and region as covariates and used AIC to see whether the relative fit of the model improved. If there was no improvement in model fit, i.e. a smaller AIC value, the best fitting model with a single covariate or no covariate was regarded as that which best explained heterogeneity in detectability. Once this best fitting model had been chosen for a species, it was applied to the encounters from surveyed squares to produce an estimate of the number of individuals of that species within each square. In total it was possible to model detectability using the data for Cheshire and Wirral for 61 common and widespread species. For a further 18 species, it was possible to calculate density estimates by assuming the detection probability was the same as calculated by Newson et al. (2008) using the entire BBS national data set for 2006. This was done by specifying the probability of detection as a multiplier in the analyses, and fixing the modelled probability of detection, by fitting a uniform distribution to the detection function with no adjustments. Although the analyses for these 18 species are statistically valid, for many of them, however, the figures seemed unrealistically too high or low when compared to knowledge of the county’s birds, and the data for only four of them are used here; these discrepancies deserve further investigation. To properly account for the sampling design, it was necessary to consider squares as belonging to two strata, pastoral squares (ELS squares + BBS pastoral squares) and non-pastoral squares. For each of the two strata a mean density estimate (and SE) was calculated using the GENMOD procedure in SAS (SAS 2001) with which we fitted a log-linear regression model with Poisson error terms and identity link. Density estimates were then multiplied by the area of each strata in Cheshire and Wirral to obtain a population size estimate for each strata. The standard error (SE) for each population estimate was calculated as: area of strata2 x SE of the appropriate density estimate. A total population estimate for Cheshire and Wirral was calculated as the sum of strata population estimates and 95% confidence intervals calculated as the Cheshire and Wirral population estimate +/- 1.96 (sqrt of summed SE’s).